The Spreckels Organ Pavilion was located on the south side of the Panama-California Exposition's Plaza de los Estados, and faced north toward the Esplanade and the Plaza de Panama. 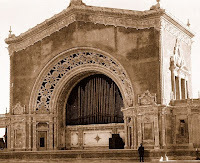 The permanent pavilion, constructed entirely of hollow terra-cotta tile, housed the great outdoor organ, presented to the exposition and the citizens of San Diego by brothers John and Adolph Spreckels. Harrison Albright was commissioned to design the Renaissance-style Plateresque-ornamented building and its curving Corinthian-columned peristyles; and Dr. Humphrey J. Stewart was hired as official exposition organist. The organ, featuring four manuals, sixty-two speaking stops, and 3,400 pipes, was constructed by the Austin Organ Company of Hartford, Connecticut. 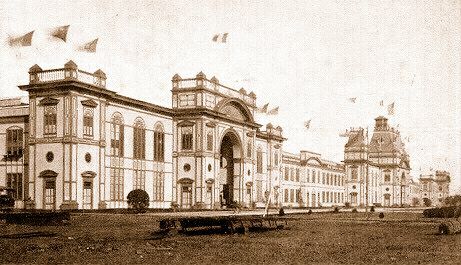 The pavilion consisted of a central gable-topped structure, containing a delicately ornamented proscenium fronted by a large concrete stage. At each side of the proscenium were placed large bronze tablets, recording the donation of the building and the names of the persons instrumental in the gift and its construction. Within the proscenium was located the massive organ, with its gilded pipes and large polished-wood console; fronted by a rolling corrugated-steel door, which could be lowered to protect the instrument from the elements. Extending from the east and west sides of the central structure were matching peristyles, with small pavilions located at each end. The flat-roofed peristyles, featuring Corinthian columns, surmounted by rooftop walks lined with balustrades and ornate finials, offered unparalleled views of San Diego and the Pacific Ocean. By night the pavilion was outlined with a myriad of 15-watt electric bulbs; being the only major structure at the exposition not illuminated by indirect lighting. Immediately east of the Spreckels Organ Pavilion was located the Salt Lake Route and Union Pacific Building, designed in a corresponding classic-style, faced with Doric columns.